Heat oven to 350°F. Spray 9-inch glass pie pan with nonstick cooking spray. In medium saucepan, combine water and margarine. Bring to a boil. Remove from heat. Add milk. With fork, stir in potato flakes until moistened. Stir in bacon. Spread mixture evenly in bottom and up sides of sprayed pan. 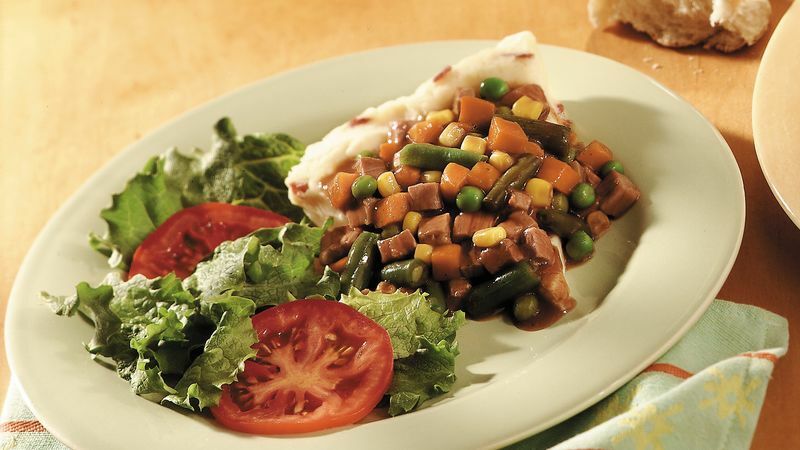 In medium skillet, combine gravy, chili sauce and vegetables. Cook over medium heat until vegetables are crisp-tender, stirring occasionally. Stir in beef. Spoon evenly into potato crust. Bake at 350°F. for 20 to 30 minutes or until thoroughly heated.